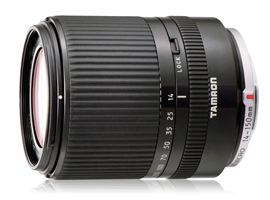 Announced in June last year, the 14-150mm F/3.5-5.8 Di III is equivalent to a 28-300mm in 35mm format and is the first super-zoom from Tamron for Micro-Four-Thirds cameras. It features a stepper-type motor for stills and video use, and although compact and lightweight, it has a metal barrel for improved durability. It also features a rounded, seven-bladed diaphragm for rendering attractive circular highlights and for smoother transitions to deliberate out-of-focus areas using differential focus. The optical construction consists of 16 elements in total, arranged in 12 groups with a total of three (two molded, one hybrid) aspherical surfaces and one LD (ED type) glass element to reduce chromatic aberrations. The lens focuses to 1.64’ (50cm), measures 2.48 x 3.36” (63 x 85.24mm), and weighs 9.88 oz (280g). It is available now for around $459 (USD). 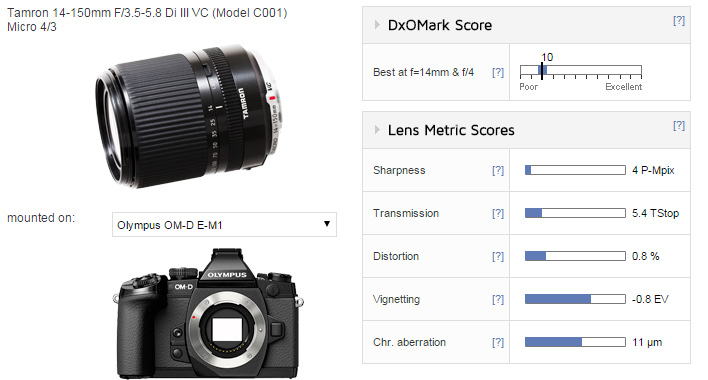 With a DxO Mark lens score of 10 points, the Tamron achieves a pretty good score for a lens like this, which is not unexpected when compared to a prime or one of the pro-level zooms with a shorter range. As such, it behaves like most super-zooms, with peak sharpness occurring closed down a stop at the shortest focal length, and sharpness falling gradually throughout the range, where finally at 150mm, sharpness is confined to a small central core. Transmission averages T5.4, but perhaps more tellingly, ranges from T4.1-6.1 — or put another way, varies from the stated aperture values by -0.5 Ev at 14mm to just -0.1Ev at 150mm. We also discovered noticeable chromatic aberration at 14mm, particularly in the extreme corners. This may be masked by vignetting wide-open to a point, but it was exacerbated on stopping down. 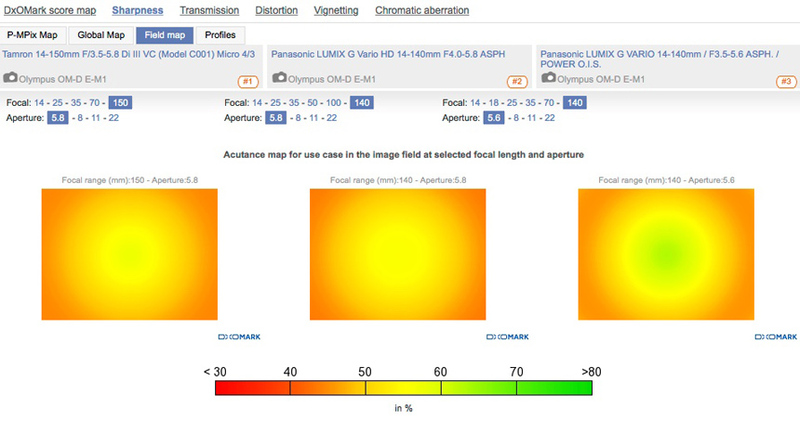 At the longer focal lengths, however, chromatic aberration was very well-controlled. As for distortion, there is noticeable barreling at 14mm, turning to pincushion at 35mm and up, but there’s no distortion at 25mm, which could be useful. Some cameras apply distortion correction anyway, and even with those that don’t, it would be relatively simply to correct with software. The Tamron is some ways behind the best zooms in the 14-150mm category, but it remains appealing because of its range and price. Tamron has chosen a focal length range that is very popular for video and is therefore already contested by both Olympus and Panasonic. While we’ve not yet had the opportunity to test the highly-regarded Olympus M.Zuiko Digital ED 14-150mm f/4-5.6, we have data on the original Panasonic Lumix G Vario HD 14-140mm F4-5.8 and its successor, the smaller and lighter 14-140mm F3.5-5.6 ASPH Power OIS. 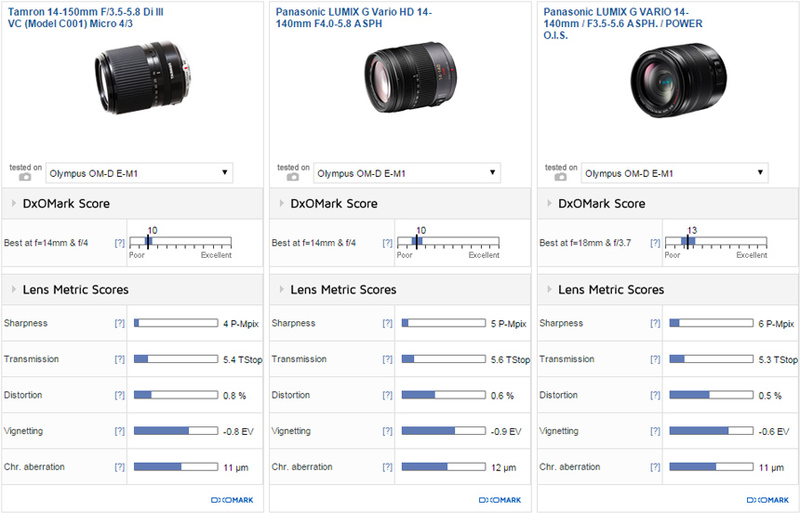 Both models are competitive in performance with the newer model, surpassing that of the original and the Tamron; however, it’s worth noting that the Panasonic lenses are more expensive. The original is very close in performance to the Tamron; however, as it’s no longer available, it’s a moot point. 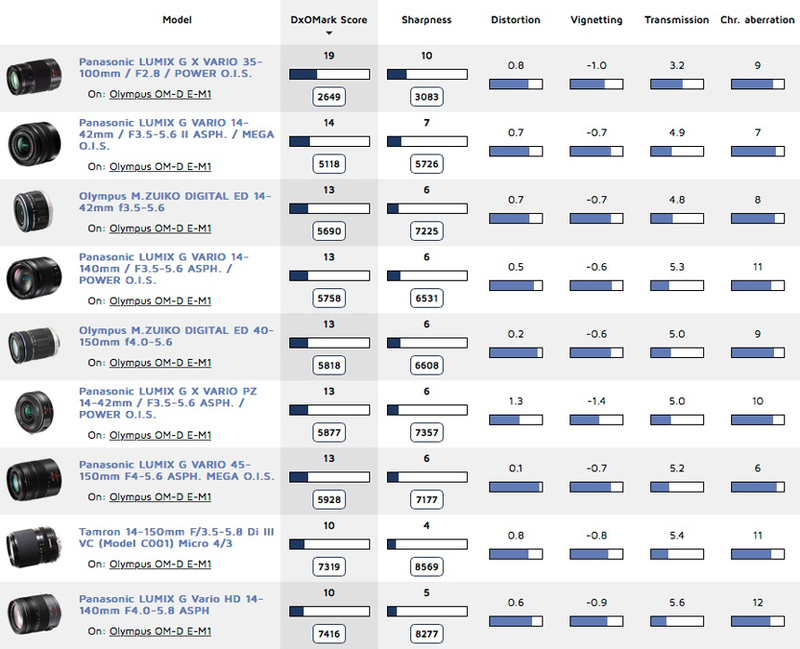 Most gains in performance of the newer model occur at shorter end of the zoom range, but the Tamron isn’t as sharp at the maximum aperture at any focal length. Even at 150mm, the Panasonic is slightly sharper in the center, although by then any advantages are slim. 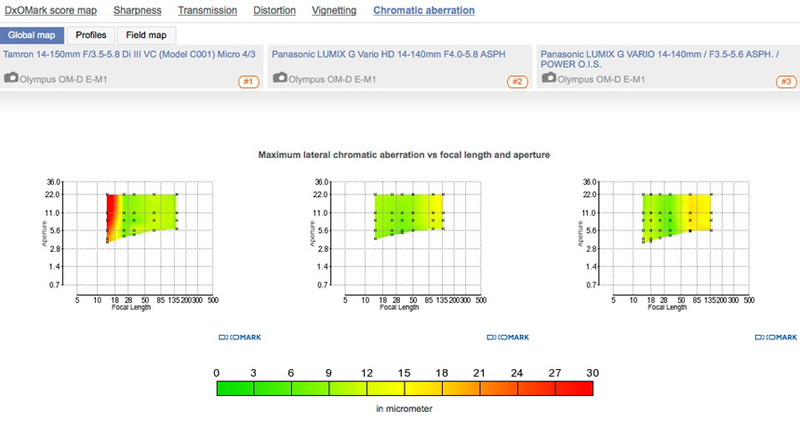 In terms of transmission, the two are very close, but while the Panasonic has very slightly more barrel distortion, it has superior correction overall, with only very slight pincushion noticeable from 50mm up. It has none of the peak (but largely restricted) levels of CA visible with the Tamron, either, though it is there from 50mm up and across much of the field, and progressively so with longer focal lengths. Sharpness doesn’t quite match the two Panasonic models at maximum aperture, although by the upper end of the zoom range, it gets close. The Tamron has some high levels of CA at 14mm, but this is mostly restricted to the extreme corners. Although the Tamron isn’t quite up to the optical performance of the equivalent offering from Panasonic, it isn’t bad by any means, particularly at the shorter focal lengths. In fact, it is very similar in performance to the original 14-140mm f/4-5.8 ASPH. The large zoom range makes lenses like this particularly attractive to video users, and at around half the price of the new Panasonic model, the main draw will be the accessibility. However, the slightly longer reach, compact dimensions and durable metal construction all add to the appeal.